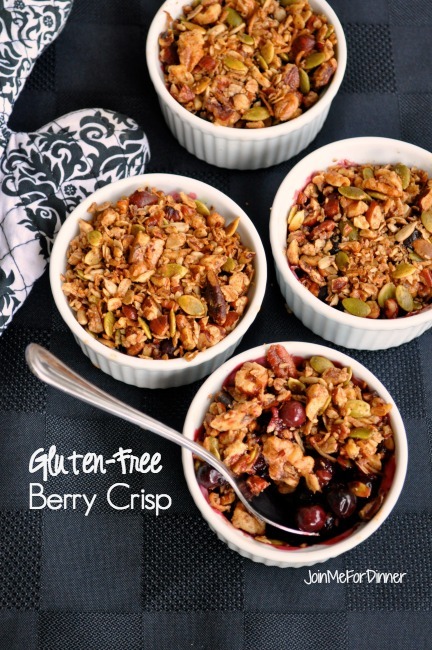 This gluten-free berry crisp is just so good for you it could be either breakfast or dessert. Or both. Use blueberies, Saskatoon berries, strawberries or whatever berries are in season in your neck of the woods. Serve it with a dollop of plain yogurt in the morning or with whipped coconut milk after dinner, or just enjoy it as is. I used Saskatoon berries because I happen to have a love affair with them and the Saskatoon berry farm just down the road has them all picked and ready for me to simply drive up and bring them home to freeze for the winter. Blueberries, or any summer fruit will work equally as well in this recipe. Just prepare your berries, spoon them into ramekins or a large baking dish and top with my Gluten-Free Hazelnut Granola. 1. Toss berries gently with tapioca starch, lemon juice, honey, almond extract and cinnamon. Spoon into 8 ramekins or a 9 inch baking dish. 2. Top with granola, making sure the berries are completely covered. Place the ramekins or baking dish on a baking sheet as the berries sometimes bubble over. 3. Bake at 350F. for approximately 25-30 minutes or until berries are bubbling. Serve warm or cold. It is equally as good! 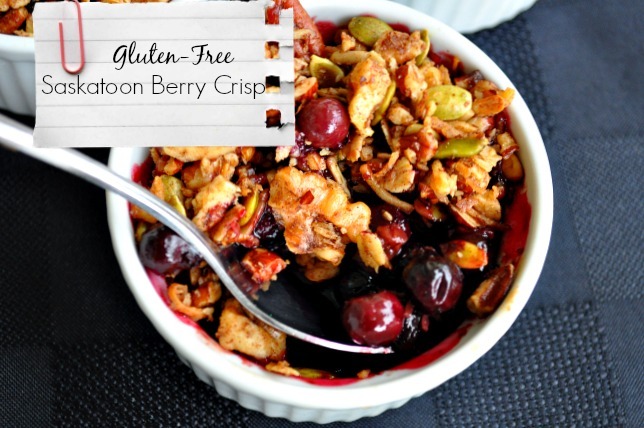 This entry was posted in breakfast, desserts, gluten-free, nuts and tagged berry crisp, blueberry crisp, clean eating dessert, dairy-free fruit crisp, gluten-free crisp, grain-free fruit crisp, Saskatoon berry crisp. Bookmark the permalink.